GoTenna produces antennae that are useable with smartphones to communicate by text with other smartphones using goTenna devices. In May 2018 the company announced that it was launching a bitcoin wallet in cooperation with Samourai Wallet that can function without the user being connected to the internet. "You need to be able to spend your bitcoin even in disaster areas," according to goTenna engineer Richard Myers. Using goTenna's txTenna, the signal looks for another goTenna user which if enmeshed with other users looks for one connected to the internet in order to spend or collect bitcoin in the wallet. 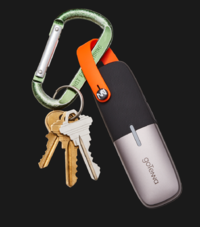 Below is a picture of a goTenna mesh device. Keys sold separately. goTenna was highlighted in a recap of Consensus 2018 by contributing editor Chuck Mackie. You can read the article here. ↑ No Cell Signal? This Can Help When You Wander Off-Grid. Wall Street Journal. ↑ GoTenna Launches a Bitcoin Wallet That Works Without the Internet. Coindesk. This page was last edited on 9 July 2018, at 15:38.